As an added safety feature, your vehicle has been equipped with a tire pressure monitoring system (TPMS) that illuminates a low tire pressure indicator when one or more of your tires is significantly under-inflated. Accordingly, when the low tire pressure indicator illuminates, you should stop and check your tires as soon as possible, and inflate them to the proper pressure. Driving on a significantly under-inflated tire causes the tire to overheat and can lead to tire failure. Under-inflation also reduces fuel efficiency and tire tread life, and may affect the vehicle’s handling and stopping ability. Please note that the TPMS is not a substitute for proper tire maintenance, and it is the driver’s responsibility to maintain correct tire pressure, even if under-inflation has not reached the level to trigger illumination of the TPMS low tire pressure indicator. Your vehicle has also been equipped with a TPMS malfunction indicator to indicate when the system is not operating properly. 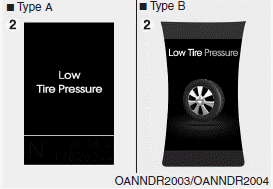 The TPMS malfunction indicator is combined with the low tire pressure indicator. When the system detects a malfunction, the indicator will flash for approximately one minute and then remain continuously illuminated. This sequence will continue upon subsequent vehicle startups as long as the malfunction exists. 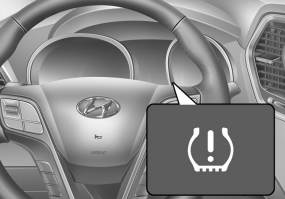 When the malfunction indicator is illuminated, the system may not be able to detect or signal low tire pressure as intended. TPMS malfunctions may occur for a variety of reasons, including the installation of replacement or alternate tires or wheels on the vehicle that prevent the TPMS from functioning properly. Always check the TPMS malfunction indicator after replacing one or more tires or wheels on your vehicle to ensure that the replacement or alternate tires and wheels allow the TPMS to continue to function properly. If the TPMS indicator does not illuminate for 3 seconds when the ignition switch is turned to the ON position or engine is running, or if it comes on after blinking for approximately one minute, take your car to your nearest authorized HYUNDAI dealer and have the system checked.